Luxury & style on Orchard Road. Welcome to Grand Park Orchard. 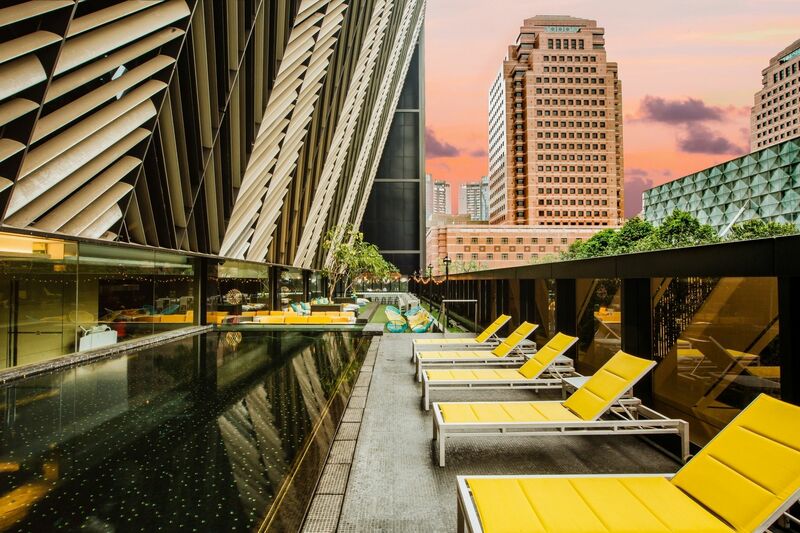 Awarded as Asia's Leading Design Hotel and one of Singapore's trendiest hotels, Grand Park Orchard is located in the heart of Singapore’s premier shopping and entertainment district. Clad in an unmissable herringbone facade and contemporary rooms, Grand Park Orchard brings its unique design aesthetic to downtown Singapore. Those in the know flock to the exciting dining options on-site - Mitzo, a modern Cantonese restaurant with superstar artisanal cocktails, and Bar Canary, a laidback alfresco bar with mesmerising fairy lights. Whats more, all rooms are equipped with complimentary smartphones with free, unlimited local data and IDD calls so staying connected is more convenient than ever. Book early and enjoy our special online rates. Save Up to 35% off our Best Flexible Rate on 45 days advanced bookings – EXCLUSIVE TO THIS SITE Up to 30% off our Best Flexible Rate on 30 days advanced bookings Up to 25% off our Best Flexible Rate on 14 days advanced bookings Book your stay directly with us and be rewarded with 7 exclusive benefits. We have made business travel easy with the essentials that you need. Book a minimum of 3 nights and enjoy*: 10% off Best Flexible Rates Buffet breakfast at Mitzo Restaurant & Bar Complimentary Wi-Fi Complimentary laundry (up to 2 pieces per room per night) Book your stay directly with us and be rewarded with 7 exclusive benefits. Grand Park Orchard presents the preferred choice for a stylish boutique accommodation in the heart of Singapore. Luxuriate in style amidst rich colours, spacious interiors, ambient lighting and the latest state-of-the-art features and designer amenities. Pamper yourself with a stay at the Crystal Club floor which comes with access to the Crystal Club Lounge. Residing on the highest floor, the Lounge offers expedited check-in and check-out, all day refreshments, complimentary breakfast, evening cocktails and a host of other privileges. For the ultimate in indulgence, guests may opt for the exclusive suites, which feature expansive and well-appointed living and entertaining areas as well as Crystal Club Lounge access. Other luxuries include butler service, Nespresso coffee machines and Chopard amenities. It is never too early to plan for your next escape or year end vacation to this island city state, Singapore. Pick whatever you fancy; either, discover rich experiences, sights, sounds and even gems that can only be found in here. Top things to do in Singapore's Civic District that you won't want to miss out on the next time when you are here.